Nenad Saljic is a Croatian artist who discovered his twin passions for photography and mountaineering early, while still in primary school. Looking at his impressive prints, it will not surprise you to know that he was almost expelled from school for spending too much time in the darkroom. 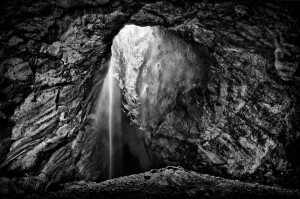 I first came across Nenad Saljic’s work when he won the Gold Award in B&W’s 2011 Singe Image Contest. 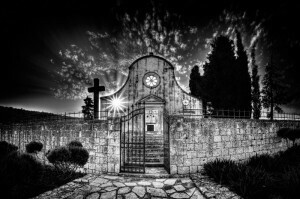 His image ‘A Church Inside a Church #1, Drvenik Veliki, Coroatia, 2010’ (above) is a stunning image full of symbolism: a prominent silhouetted cross, the overhead sweeping heavens and a slightly elevated composition that suggests we have ascended ‘above’. The starburst sets a mystical, evangelical overtone; the open gate invites us to pass through (over?) and enter this centred, meditative space. It’s universal, it’s bigger than us. And perhaps better. Nenad Saljic produces images that seem concerned with overt spiritual messages and inspirations; his recent 2011 work such as ‘Walk the Line’ also connotes mysticism. There’s a force of nature captured so strongly its significance is reflected in its overt presence. Big fat thumbs up. 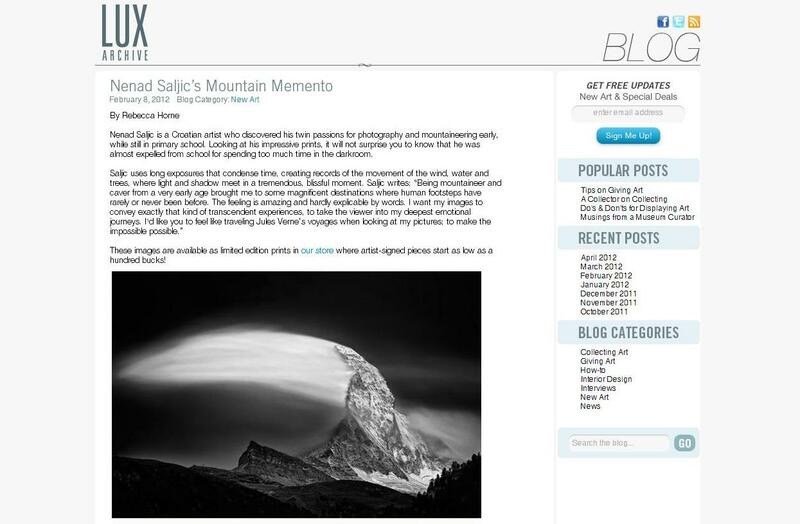 Croatian Nenad Saljic fell in love with photography and the mountains in his early teens. Of course, life has a habit of getting in the way and in the course of some life events, he pretty much left his passions unpursued. Fortunately for Saljic (and the rest of us) he rediscovered his passion for photography and has graced us with some beautiful black and white photos. 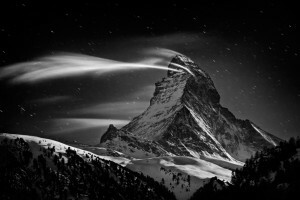 In 2009 and 2010 he produced a series called “Matterhorn”, which are, of course, shots of The Matterhorn in the Pennine Alps. The photo below, entitled “Evening Clouds”, comes from this series. Few things can bring forth the image a grand conjuration than watching clouds borne from orographically influenced winds. I was treated to a few myself as a Weather Observer in the United States Air Force, although admittedly nothing to this scale. I’m reminded of the great eye of Sauron from the Lord of the Rings trilogy. I wonder if this is the last thing that most of the rest of Middle Earth will see before the shadow of death descends upon them. One almost gets the feeling of being a Hobbit watching from a hiding place as the conjuration of evil begins to really take hold. The play on the tones is the part that sets the mood of this photograph. The dark foreground tones suggest a hiding place – we have our safe vantage point and as long as the mountain can’t see us we are safe. The moutain itself is mostly low-key in tone. Toward the bottom it is lighter and gets darker as you go up, which suggest that a transformation of sorts is taking place. Of course, the clouds are the stars of this photograph. The brilliant white stands in stark contrast to the rest of the photo, letting us that we are in for something. The beauty of the clouds belies both the violence that produced them and the violence that is sure to follow their conjuration. And when one looks at the fact that the peak of The Matterhorn is enveloped by the clouds, one can’t help but get the impression that they’re in the path of the full force of what’s to come. Of course, these clouds are merely the result of updrafts over the surface of the mountian. Even though I can’t see the rest of the sky, I would safely assume that support for these clouds is almost non-existent at a few miles from the mountian itself. Of course, not many people outside the meteorological community (or those who live near the mountain) would necessarily know that. Normally when we see photographs of the power of nature, it’s in the aftermath of whatever phenomenon took place. 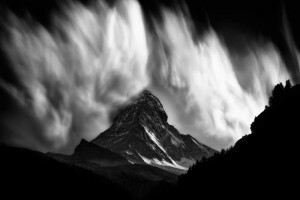 This photograph provides a rare glimpse at how powerful nature is, even on a small scale. What makes this photograph even more powerful is that it almost seems to contain that power, even though we know what’s coming toward us. The play on the tones of the photo suggests a doom scenario where Mother Nature is releasing her full power and the viewer, unfortunately, is about to be caught up in it.